The HoshinFest 2012 DVDs feature Soke Rob Williams showing high level Hoshin principles on day one, while focusing on healing and astral projection the next day. HoshinFest 2011 features more teachings from the source from Soke Rob Williams, as well as current Bujinkan training from Shihan Doug Tweedy. With multiple hours of footage and multiple camera views, Hoshinfest 2009 guides you through various systems of the ryu including martial arts, healing techniques and spiritual awakening. Soke Rob Williams shows the Godai Waza (techniques designed to help you assimilate the elements into your practice), while Shihan James Alexander demonstrates crippling grappling techniques that will have you feeling sorry for the uke. Soke Rob Williams lends some valuable advice on how to shield yourself from negative influences in your day to day world while Dr. Susan Carlson leads the Shaktipat session, sharing personal experiences to help guide you on the path to actualizing the Kundalini warrior within. Soke Rob Williams dives into the Hoshin Healing course with some beneficial myofascial release and keeps us on the edge of our seat during the Sword Circle demonstration. 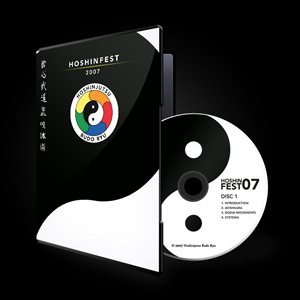 Hoshinfest 2009 is a must-have for anyone interested in advancing their practice in Hoshin or adding to their own martial art or everyday life. This amazing seminar contains rare and higher level material that will keep you busy for years. The HoshinFest 2008 DVDs feature an introduction by Soke Rob Williams and core Hoshinjutsu principles, Silat and 5 point breathing chi kung from Guru Santiago Dobles, energetic acupuncture techniques from Esly Caldwell, face-winding techniques from Shihan Chris Robinson, Systema from Justin Henry Sensei, and gun disarming from Seth Berman. The HoshinFest 2007 DVDs feature an introduction by Soke Rob Willliams, avishkara by Guru Tao Semko, elemental movements of the Godai by Soke Rob Williams, Systema by Shihan Chris Robinson, knife defense from Alan Antopol Sensei, Silat from Guru Santiago Dobles, ground fighting from Shihan James Alexander, healing from Guru Tao Semko and a demonstration of energy dynamics from Soke Rob Williams. Created by a modern day Academic Professor trained in Western Science with a keen eye for causing the most amount of pain with the least amount of effort, Hoshinjutsu has found its firm place among practical and highly effective martial arts systems. 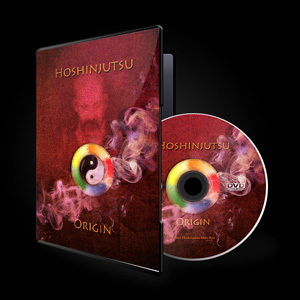 Hoshinjutsu: Origin traces its creation with archival footage from founder Dr. Glenn J. Morris (Path Notes of an American Ninja Master) as he begins the process of developing a system that not only teaches one physical mastery, but self-mastery as well. This DVD is a rare glimpse into the early days of Hoshinjutsu, to be valued by current members of the style as well as those seeking to discover more of the history of this unique martial art.